My family never really celebrated Tu Bishvat, though I do have faint recollections of making little tree-shaped hats in Hebrew school to mark the occasion. As an adult I’ve noticed that Tu Bishvat seders are catching on among environmentally-minded Jews like me, so I decided to throw one to see what they were like. Since it was my first time at a Tu Bishvat seder, I was on equal footing with many of our guests who were either not Jewish or were but didn’t know their Tu Bishvat from their Lag B’Omer. Those that were Jewish were excited for the opportunity to experience a new tradition, and those who were not jumped at the offer to participate in such a colorful holiday, though no matter how many times I repeated it, many of them could not pronounce its name. 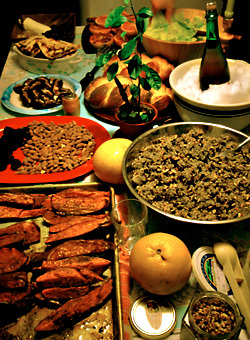 You can see that Aaron’s Tu Bishvat seder was all about the food from this photo he took of the table. Regardless, the seder was a huge hit, and I strongly recommend having one, especially if you’re looking for an activity that is interfaith-friendly but still Jewish in nature (emphasis on the nature). I can’t think of any other Jewish holiday that would be easier to participate in or more attractive to someone from another faith. Who doesn’t want to hang out, have a few drinks and talk about fruit? I was raised in a Reform congregation and my girlfriend grew up in a more religious evangelist Christian household. Her dad was also the pastor of their church. As adults we’re both religious pluralists, a position which is never more apparent than at the gatherings we often hold at our apartment. I went to Brandeis (also know as “Jew U”), she went to Gordon, a non-denominational but very much Christian college, and our parties are often a 50-50 blend of alumni from both institutions. We were curious to see what it would be like to have that same crowd at a religiously themed event. Fortunately, Tu Bishvat isn’t “religious” in any way that might be off-putting. There is no reference to the holiday in the Torah, meaning there are no commandments governing its observance. What I gathered from my research is that, like many Jewish holidays, it all comes down to food. Tu Bishvat is a holiday that focuses on trees, and is know as both the “Jewish Arbor Day” and the “New Year for Trees.” The date coincides with the blossoming of the first fruit trees in Israel, hence we celebrate by consuming various foods that come from trees and/or Israel, such as figs and pomegranates. Given my personal food ethics, I also wanted to incorporate local, seasonal fruits from New England, where I live. Luckily one of our guests was wild foods expert Russ Cohen, who contributed toasted shagbark hickory nuts and homemade chicory ice cream, both of which were fantastic and included ingredients made from foraged foods. We also popped a bottle of West County Cider‘s Reine de Pomme, a hard cider made entirely in-state, and we drank pine tea brewed from needles gathered in the woods behind the house. You might not be able to find locally grown food at the supermarket during a New England winter, but that doesn’t mean that it’s not out there. Of course there were Israeli tree goodies as well, such as stuffed dates, flatbread topped with goat cheese, caramelized shallots and more dates, salad with a pomegranate reduction vinegarette and roasted sweet potatoes glazed with palm sugar. I also wanted to have something in season from my childhood home in South Florida, so I decided on broiled grapefruit. (Though warm, splotchy, burnt grapefruit would be a more accurate description of the result.) My girlfriend may not be Jewish, but she can make picture perfect challah from scratch and by heart, so we had to have those, and a chef friend of mine who helped devise the menu whipped up a lemon curd and banana cream pie. The pie was so popular that everyone accidentally ate the parchment paper it was served on, mistaking it for part of the flaky, orange blossom water crust. Like many Jewish practices, with Tu Bishvat you can go as deep as you care to. There are established prayers associated with the holiday, such as saying the shehekhianu blessing on new experiences for eating a fruit that you haven’t had in a while. In the spirit of inclusivity, we decided on a simple combination of feasting and discussion. The seder was a huge hit, and everyone expressed their desire for it to become an annual tradition. Regardless of your religion, there’s little not to like about Tu Bishvat. The only downside came after the seder had ended, when I received a call from some of our guests who were stranded on the side of the highway. They had hit a pothole and blown a tire while looking at a particularly beautiful tree. Aaron Kagan is a freelance writer living in the Boston area. He blogs at http://teaandfood.blogspot.com/.